We provide an extensive selection of used mobile cranes for a wide range of applications. 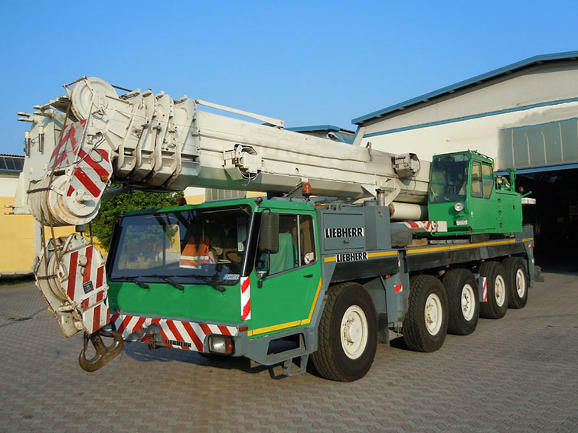 Mobile cranes are needed for especially heavy loads and complex construction and loading jobs because the usual commercial vehicles such as lorries, forklifts and excavator were sometimes not designed to handle these kinds of tasks. In these situations, a lorry-mounted crane is a better alternative than your own loading tool. Mobile cranes are available from many reputable manufacturers mostly as mobile cranes for heavy loads and as a special add-on to lorries so that they can be quickly moved to any desired location. A crane can transform any conventional lorry into a stable, heavy-duty equipment carriers. Meanwhile, mobile cranes have found uses especially in the construction industry but also in agriculture and forestry. Used mobile cranes come in a variety of sizes, designs and load limits, depending on availability. Often, these are mounted on flatbed lorries, and, depending on the model, either at the rear of the vehicle or between the cab and the lorry bed. Their design usually consists of a folding crane and a hook as well as lateral support for stabilization. The hydraulics are controlled via a control box on the crane or by remote control. Larger crane models have a seat for the driver, similar to excavators or bulldozers. Cranes mounted on the rear of lorries have a smaller range of up to four metres, while models mounted near the cab provide more length. Due to the stability centred on the vehicle, extensions of up to eight metres are possible. Depending on the application, you can equip your used cranes with different grips. A pallet fork is available for boxes, crates and containers; it can carry up to 1.5 tonnes of conventional euro pallets in a single load. In the construction sector, on the other hand, a brick-stack grapple comes in handy to securely grab and load stones, bags, building components and bulky, heavy objects. To load sand and debris, you can mount a robust clamshell bucket on the truck-mounted crane and with industry-standard buckets pick up payloads of up to 200 litres. Crawler cranes and lattice masts are also used with mobile cranes. The larger models of these cranes are mounted on multi-axis lorries to ensure the greatest stability. They are equipped with telescopic arms that can effortlessly handle heavy loads of concrete pieces and steel beams weighing up to several hundred tonnes. The longest telescopic arms can extend between 40 and 60 metres and are used in the construction of build high-rise buildings, excavation, installing overhead wires, bridge construction and on drilling rigs. Smaller variants can telescope up to 20 metres and are suitable for loads of up to about five tonnes. Well-known manufacturers of truck-mounted cranes include Mercedes Benz, Iveco, MAN, Gottwald, Scania, Liebherr, Demag, Terex, Effer and Faun.